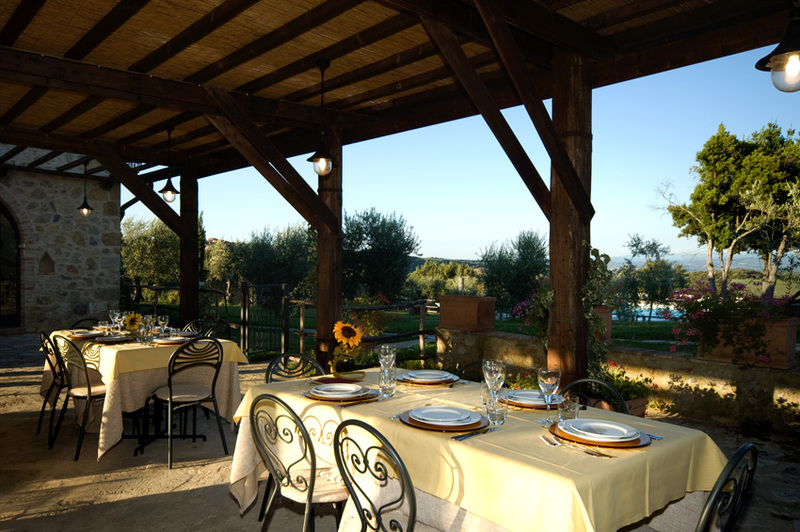 The relaxing atmosphere of the hills around Siena and the flavours of traditional Tuscan cuisine meet together at the "Locanda del Borgo", where typical local dishes accompanied by the finest selection of national and local wines are served. The menu is based on traditional recipes handed down from generation to generation preserving the authenticity and flavour of the past, also thanks to careful selection of local top quality ingredients. The dishes are prepared by only using products from the "short supply chain" or products acquired directly from local farms. This guarantees the freshness and quality of the product, which is completely organic. The fragrances and flavours of the cuisine are exalted by the refined Tuscan extra virgin olive oil produced by the Estate. Everyday the kitchen, exclusively homemade, offers something different: starter, first course with handmade pasta, second course with meat, and dessert. The pasta is of a high standard and handmade every day: ravioli stuffed with potatoes and mushrooms, "stracchino" soft cheese or ricotta and spinach, gnocchi, lasagne and tagliatelle. At least once a week pizza is prepared, cooked in the Estate's wood oven. In the restaurant's barbecue are grilled excellent "Fiorentina" T-bone steaks. The wine cellar offers several varieties of selected wines from local wine makers. 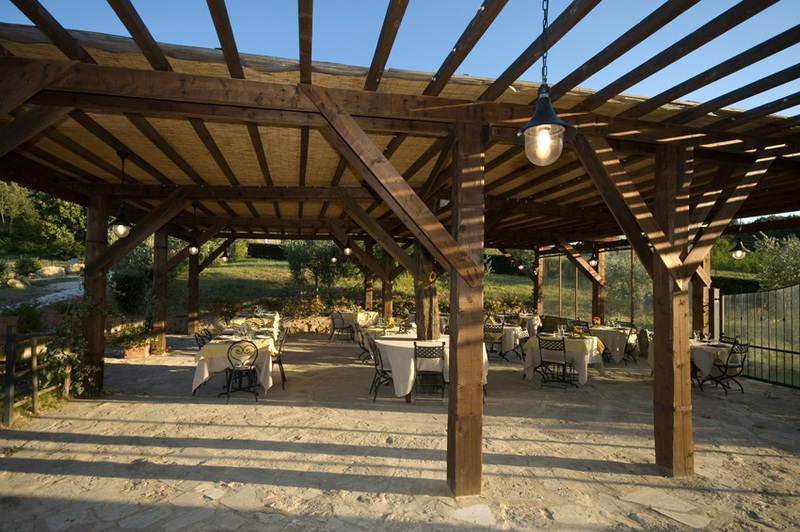 Both inside and on the large veranda, in a relaxing landscape immersed in nature, the Restaurant offers its clients the possibility of combining tastes and delicate fragrances of its dishes along with enjoying the pleasing and relaxing colours of the typical Tuscan countryside. The staff take care of the minor details, in particular the restaurant service during your stay, business lunch or dinner or unforgettable events, thanks to the collaboration of qualified staff always attentive to the needs of the clients. Dinner is the most important appointment to end the day, fully respecting the delicacy and flavours of antique Tuscan cuisine, everything is accompanied with the finest local and national wines skilfully served by the attentive staff, prepared to satisfy even the most refined palates.